The HTC/Facebook marriage has been a strong one for the most part, dating all the way back to the launch of the HTC Status in 2011. Granted the phone wasn’t the groundbreaking device many socialites expected, many attributed it as a steppingstone to what would come forth from both tech staples—that being the unofficial Facebook phone most recently known as the HTC First. Backed by the social media giant’s new mobile user interface, Facebook Home, and HTC’s renowned design portfolio, expectations ride high for what AT&T’s billed as its new flagship phone. So is this the Facebook phone we’ve been anticipating this entire time or are we looking at just an upgraded version of the Status? Facebook’s interface dominates the entire user experience from the moment you turn on the device. The home and lock screens are practically brought together, serving as the core area for all social media updates that flood the Cover Feed. Here you’ll see all the latest posts from followers’ speed across the screen, which you can either like without having to access the Facebook Android app. This version of Home is exclusive to the First and supports full integration for third-party programs like Gmail, Twitter, and more. Another sweet option offered here is the ability to switch back and forth between Home and Jelly Bean’s stock interface. The one feature to be most excited about is Chat Heads, which delivers incoming messages and alerts directly to the home screen and allows users to interact immediately with others without having to take any additional steps. A circular icon appears and display’s a follower’s profile picture. Up to four can preoccupy the screen simultaneously and be moved around, plus each one is accessible while engaging in other apps. Facebooking has been simplified. A 4.3-inch Super LCD panel might seem like a far cry from the larger 5-inch+ panels featured on recent smarpthones like the Droid DNA and Samsung Galaxy Note II. That’s not to say the First’s screen doesn’t deliver on the visual end. 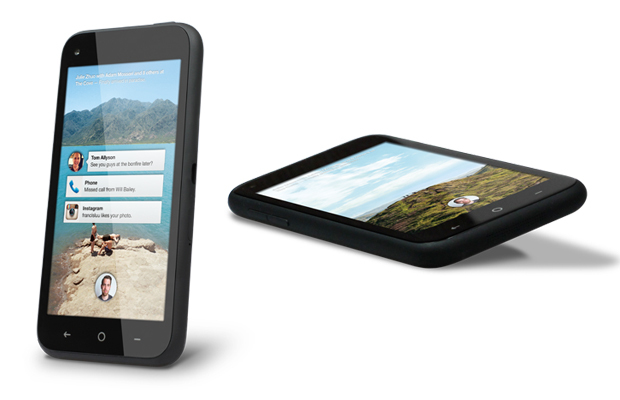 As a matter of fact, it produces a higher pixel resolution (341) ppi than the iPhone 5 (326) and Galaxy Note II (267 ppi). Images and text are sharp, while games and HD videos look vibrant. It’s also worth nothing how impressive the viewing angles are on the phone, as you’ll be able to watch everything clearly at different glances. The First sports a unibody form factor made from soft-touch plastic that makes for a smooth and sturdy feel when placed in your palm. It’s lighter than most handsets at 4.56 oz. and tackles a more traditional design that completely works for its price point. The device also comes available in four colors: including black, white, pale blue, and red. Aside from the beautiful display, the First lacks the internal firepower found on heavyweight smartphones like the HTC One and Samsung Galaxy GS IV. Qualcomm’s new 1.4GHz dual-core CPU does produce solid benchmarks, but it’s nowhere near the level of any quad-core processor on the market. Plus 1GB of RAM is crumbs in comparison to the 2GB featured on most next-gen devices. But the spec sheet isn’t as disappointing as HTC’s decision to exclude some of its most prominent features on the device. We’re talking about the manufacturer’s phenomenal 8MP camera and Sense 5.0. We would have even settled for some Beats Audio integration. Nothing here. 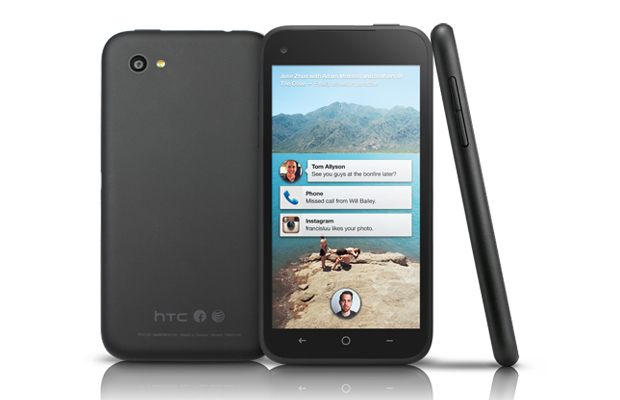 The HTC First serves more as a platform to push Facebook’s new social media feature on the Android circuit. 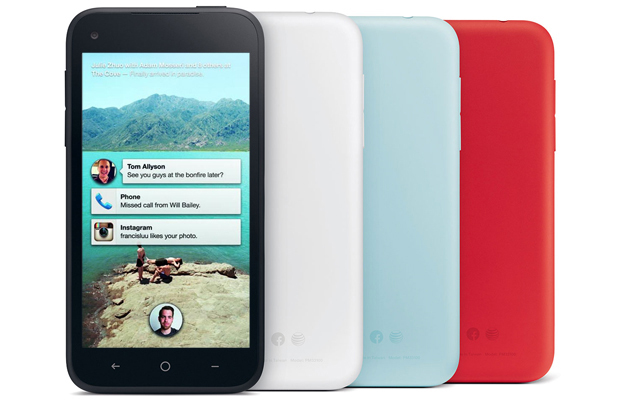 It’s not the Facebook phone everyone’s foolishly anticipated. And when taking into account the missing trademark features and weak hardware associated with HTC, it barely holds its own as a standout mid-level device. But the major selling point here is the software. The opportunity to take in Home on an exclusive level is also a plus, along with the flexibility of switching between Facebook and Android’s interfaces. So if social media is your one primary vice, it’s worth giving the First a test run, especially at its unbeatable price tag of $100.